Goals can be likened to objectives or pit stops on the way to a destination. You may have a fairly large goal (destination) in mind for your business, like a certain income level you would like to reach. Next, you want to keep track of where you are at (pit stops = smaller goals) on your road map to reaching your target goal. The only way you will reach your goal is by focusing on your goal consistently long enough that you program your subconscious with your goal. Your subconscious pretty much runs the show, so if your subconscious isn’t aligned with your goal, you will likely not reach your goal. A simple way of programming (or communicating with) your subconscious with your intended goal is by practicing visualization. You must focus on your goal (the outcome) for a little (as little as 30 seconds to 1 minute) each day and feel good about it. Something you can do to keep track of where you are currently at in relation to your destination/goal is to look at a road map. As this relates to goal setting, you can create a chart on a piece of paper or card board and stick it to the wall where you will see it regularly. 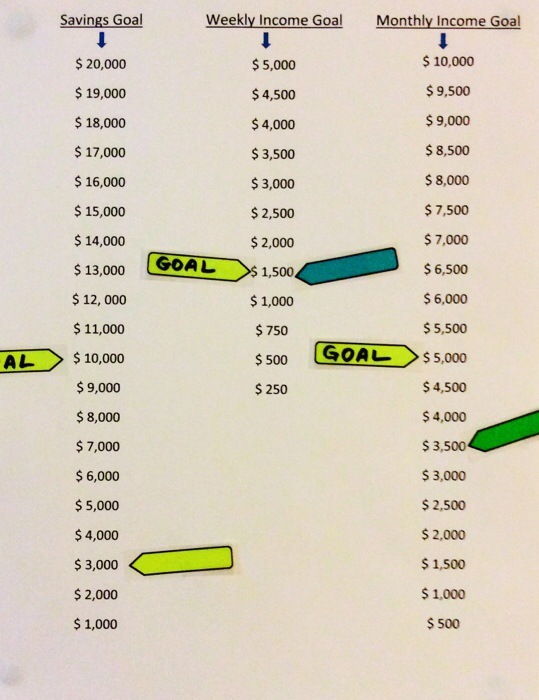 Put your goal at the top and have interval markers from the bottom all the way up to your goal. 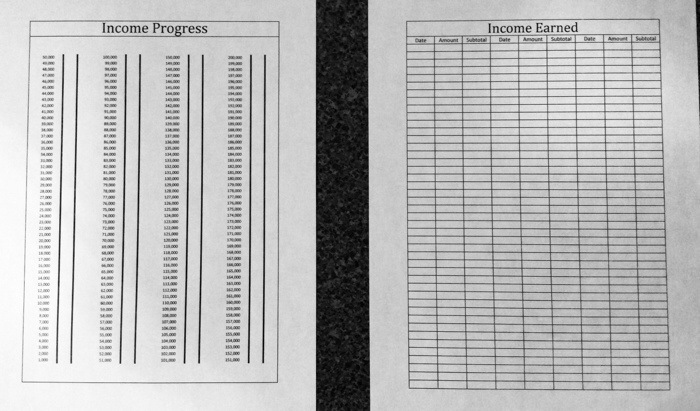 If it’s an income goal, put your desired income at the top and put smaller mini goals all the way down to the bottom starting with zero. Now grab a sticky note, put the word ‘goal’ on it, draw an arrow beside it, and stick it beside an amount you can realistically reach for. Now grab another sticky note, put an arrow on it and stick it by zero. Be sure to place this chart you have created on a wall of your home in an obvious place such as your bedroom wall. This is a great place to program your subconscious because when you are sleepy, this is the best time to communicate with your subconscious and ultimately program yourself with your goal. If you feel bad when you think about your goal there may be some conflict in your subconscious as it relates to your goal and this could prevent you from reaching your goal. If this is the case, you may have to do some clearing work whenever you feel bad as it relates to your goal. You could do the “emotional freedom technique.” This is a simple, yet powerful practice that can assist you in clearing unwanted negative emotions that may be holding you back from reaching your goals in life. If you’re not familiar with this, you can google “eft” and/or search YouTube for how-to videos. When you genuinely feel good when you focus on having your intended goal, you know you are in alignment with it. This is where you want to be in order to reach your intended goals (whatever they might be). When you think about your goal, do you get excited and full of anticipation knowing that not only you can, you WILL reach your goal and keep going? This is the kind of emotional state you want to be in when you are in action working towards your goals. This feeling of excitement and passion will propel you through challenges and perceived set backs you might experience along he way to reaching a goal. Most goal setting programs place a lot of importance on taking massive action and this is very good in reaching your goal. If you are taking action in a negative state though, you may potentially be doing more harm than good in your life. For more info on this, please visit an earlier blog post to learn about the different levels of power related to your state. Anyone can take action. Your goal is to take action while in a positive state. This may be a little challenging in the beginning and what you can do is focus on your goal while you are working toward it. When I am on the job, I am focused on doing the task at hand in the best possible way. Beneath the radar (in my subconscious), I am super excited because I have my goal in mind while I’m working. I’m actually visualizing and pretty much daydreaming about my goals while I work. I have been doing this long enough that it has become a habit and I sometimes find myself seeing myself in the future already having achieved my goals and setting larger goals to work toward. When you make visualizing your goals a practice/habit you will find they manifest faster and more easily/effortlessly because you are feeling so good about them. If you are feeling good about your goal and you don’t achieve you goal, you may not even mind since you are in a more neutral state. Your intended state you can reach for is to be neutral and to be okay with where you are at (willingness and acceptance). Next, get excited. Find something that inspires you to action and go for it! Take appropriate action toward your goal, whether it be income, a business goal, or a personal goal. Know that if others can do it, so can you. By practicing these techniques you can and will reach your goals much more effortlessly and you can even have fun in the process. Now go get em! If you have enjoyed this article, please hit one of the social buttons and/or share a comment below. And as always, thanks for reading. It’s also helpful when you make goals to also make a set of steps to reach the goal. Take one step at a time. Soon you get there!